Since comparisons between Presidents George W. Bush and Barack Obama appear to be very popular these days, I have added another chart to the mix. I was curious if there were any major differences between the number of bankruptcy filings during the Bush and the Obama administrations. I decided to focus on bankruptcy filings, because I thought they would rise during periods of economic stagnation, and fall during periods of strong economic growth. However, a cursory glance seems to show that bankruptcy fillings do not appear to have a particularly strong correlation with weak economic growth. However, the spike in bankruptcy filings in the December 2005 quarter appears to reflect the last mad dash of people filing for personal bankruptcy before a law that Congress passed in October 2005 took effect at the beginning of 2006. As such, it was far easier for people to declare bankruptcy before 2006 than it was after. The average number of quarterly bankruptcy filings averaged roughly 343,000 during the Bush Administration vs. about 381,000 during the Obama Administration, even though it is now much more difficult for individuals to file for personal bankruptcy. If one only includes bankruptcy filings after 2005, President Bush’s average falls to roughly 216,000 vs. 420,000 before the change in U.S. bankruptcy law. 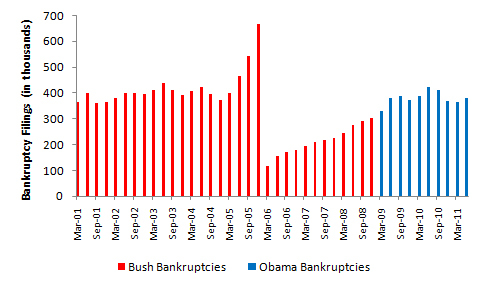 Therefore, the significant change in bankruptcy law during this period makes it very difficult to do an adequate apples-to-apples comparison between the Bush and Obama administrations. So it seems the jury is still out on this one. This entry was posted in Business, Finance and Economics, Policy, Politics, Taxes and tagged Bankruptcies, Bush vs. Obama, President George W. Bush, President Obama, United States Courts. Bookmark the permalink. Bush championed the law (took credit for his administration’s initiating it) and praised it afterwards. Any good bankruptcy attorney could have told the president that filings would never decrease so long as the law only put extra burdens on bankruptcy attorneys (which the law did). The public in general doesn’t know that making it harder to file bankruptcy doesn’t really significantly affect consumers — only the amount of work required by bankruptcy attorneys, whose fees are controlled by the bankruptcy court. The surplus of attorneys is the main reason you won’t see dramatic decreases in bankruptcy filings.